The Georgia Trail Summit is part traditional conference and part UNconference. The traditional concurrent sessions and keynote are arranged by us and the UNconference session topics and activities are suggested by YOU, the attendees. In short, in addition to talks and presentations from big names in trails, we provide an opportunity for every attendee to be a participant in shaping and leading the event. Be prepared to get involved and meet people. Bring your business cards! We borrowed the format from Smart Growth, CNU, and Transportation Camp which offers a great description of how it works in case you want more detail, but know that our sessions will be 30 minute slots. In a nutshell, the WALL is where it happens. 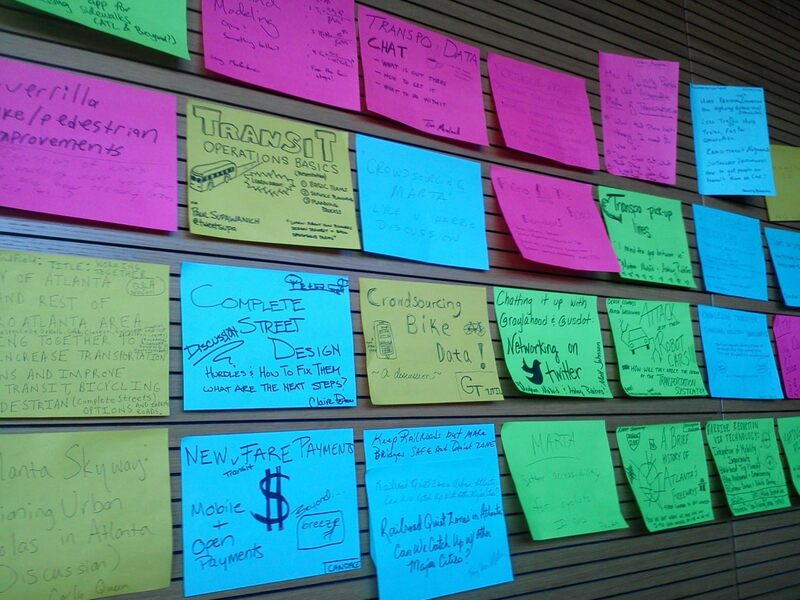 You suggest a topic, write it on a card, stick it on the wall. While everyone is at lunch, we organize the wall, and assign all the topics a facilitator, scribe, and a table location at which to chat. After lunch, we chat. One tip: follow the rule of two feet…if you don’t like a topic after it starts, use your two feet and move to another one! Note: if you want to facilitate a session, include your name on the topic card. Artwork is optional ;-). Major themes include these suggestions below and more to come from you. We say ‘bring it’ and we hope you will! So far we have confirmed 13 ‘expert facilitators’ so even if you don’t think you can lead a session, suggest it, because there will be Georgia folks on hand who can, from organizations like Georgia Canoe Association, Silver Comet Trail, PATH Foundation, US Forest Service, ALTA Planning + Design, Rails to Trails Conservancy, Will & Perkins, Kennesaw Mtn Trail Club, Georgia River Network , SORBA, Georgia Bikes, MillionMile Greenway, Georgia Bicycle Adventures, cMEcompete, East Coast Greenway, and regional commissions. More are invited and we hope to confirm them very soon. We’ve also arranged student scribes to capture the great takeaways from each session and share them ALL with you post summit in a shared document. Topics for the UNconference – this sample list survey appears on the registration form so be sure to complete it. Be thinking about topics to suggest at breakfast on Day 1. We’ll try to get to them ALL! Overcoming objections to new trails and the NIMBYs, Don’t let them stop you!